1. A Sweet and Bitter Providence, by The Joy Eternal--I have heard great things about the book by the same title (John Piper) from my husband, and thought I would try out this new-ish CD release. Wow!....is all I can say. The sounds are deep, a bit melancholy at times, but rich with doctrine and soooooo very encouraging to me as I have walked through changes and struggles over the last few weeks. I can't say that I have ever heard an album quite like this. If you, or someone you know, is going through a trying time, I would check this out for sure! 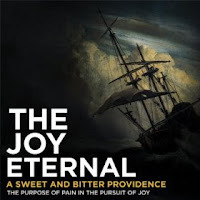 The tunes will not leave you with the happy-paste-a-smile-on kind of joy, but with the deep, lasting, and soul-satisfying joy that can only be find in the Christ of the Gospel. 2. The Far Country, by Andrew Peterson--this one is a little more up-beat, but the lyrics are still very rich and encouraging. 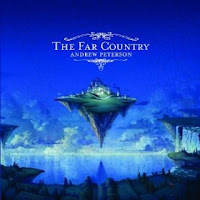 You will find the CD to be a little more heavily laden with a story-telling style, Peterson's trademark. I found myself connecting with the depth of the lyrics and the joy laced through the folksy rhythms. You will recognize the ghost of Rich Mullins walking through the songs, with similar rhythms and style. This album will point you towards heaven, as you, we, all learn to walk in this 'far country' where we find ourselves. 3. 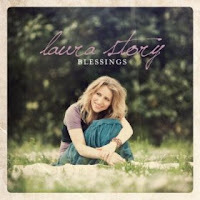 Blessings, by Laura Story--I was captivated by Laura's worship music as I listened to an old interview she gave on Moody's Midday Connection. [So much so, it reminded me of my love for singing and how much I need to get back into that!] She is incredibly humble about her musical gifts, and has walked some tough roads, including her husband's brain tumor diagnosis only a couple years into their marriage. As the worship leader for her home church, Laura is always practicing her new songs on her congregation, and this album is no different--tried and tested, and very joyful, Christ-exalting, and meaningful. Several of the tunes stuck with me throughout the day, but you can't beat the title track, Blessings, which delves into the nature of trials as blessings in disguise....You will be sure to find encouragement in this new CD!